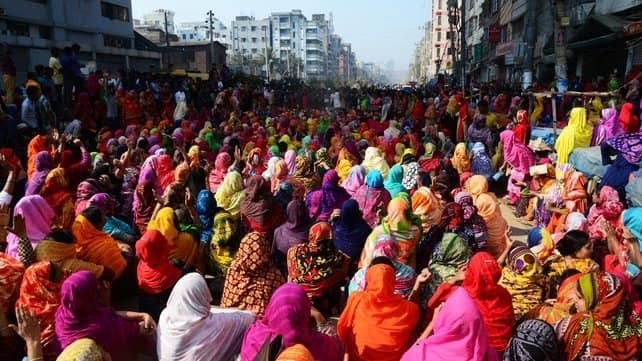 Recently, thousands of garment workers in Bangladesh went on a militant strike in protest against the Government’s newly announced revised pay structure that violated earlier promises made to the workers. A report by GroundXero on the spontaneous workers’ struggle that rocked Bangladesh and ended in a partial victory for the workers. Fresh spell of labour unrest sparked off in Bangladesh with the setting in of the new year. Starting January 5, Bangladeshi apparel workers started blocking key roads connected to the Dhaka-Mymensingh Highway at Uttara, Dhaka-Tangail Highway at Zamgora and the Dhaka-Aricha Highway at Hemayetpur, bringing nearly the entire country to a halt. Their main demand was hike in the minimum wages, together with other demands such as basic pay fixation, fixing of overtime rates, proper allowances and bonuses, maternity leave, and guarantee of job security for protesting/striking workers. 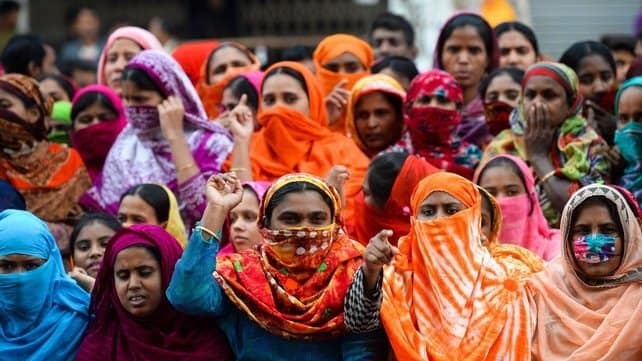 This latest phase of the long-drawn struggle of garment workers in Bangladesh started in early December last year, after the workers rejected the Government’s newly announced revised pay structure that violated earlier promises. Photo: Sophia Zaman. Source: Facebook. On January 8, police opened fire on the protesting workers. Sumon Miah (22), a finishing section operator of Anlima Yarn Dying Ltd at Ulail of Savar industrial belt, died from a bullet to his chest. Several other workers were also critically injured in the firings. This killing sparked spontaneous anti-police protest demonstrations across the country, led by the workers, in defiance of the traditional Trade Union leadership that tried to convince the workers to get back to work. 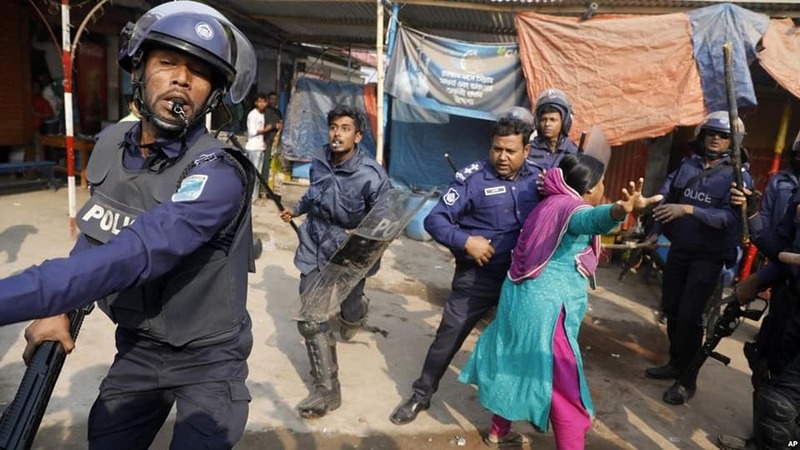 On January 10, clashes broke out between the police and striking workers in Savar, on the outskirts of Dhaka, and in Gazipur, in which at least 70 persons, including 10 law enforcers, reportedly got injured. 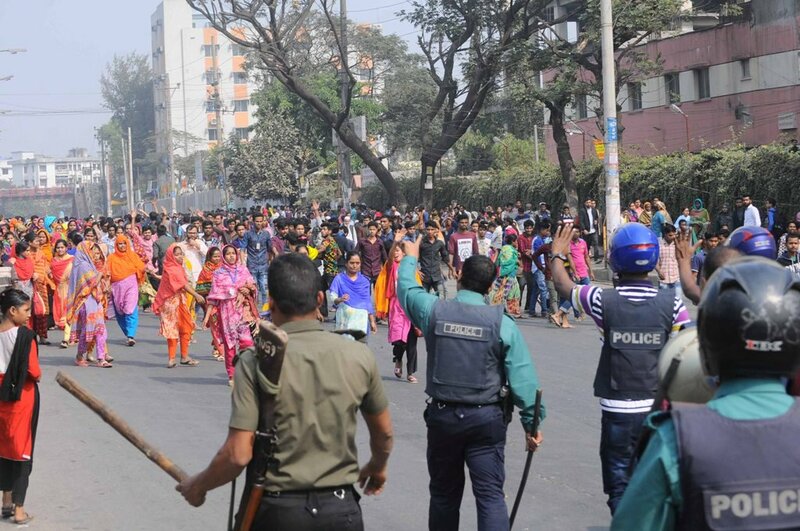 Defying brutal armed repression, thousands of workers at Ashulia, Gazipur and Uttara, broke out into spontaneous demonstrations in the labour-intensive industrial belts to press their demand, forcing closure of at least 100 garment factories. “If production halt continues we will be forced to shut factories for an indefinite period,” threatened the BGMEA Vice President Mohammed Nasir. Multiple platoons of the Border Guards were deployed in and around Dhaka to contain the strike. But the agitation kept gathering steam. Workers of the Al-Muslim Group and other factories blockaded Dhaka-Aricha Highway at Ulail in the face of lathi-charge, bursting of tear gas shells and water cannons. 40 RMG workers were reportedly injured. At Ashulia, thousands of workers from garment factories of Ha-Meem Group, Sharmin Group, Deko Group, New Age and Knit Asia blocked the Dhaka-Tangail Highway at Narashinghapur. In Gazipur, at least 20 people including two journalists were injured in clashes between the workers and the police. Agitated workers from factories at Gazipura, Nawroj, Signboard, Board Bazar and Tongi held demonstrations suspending production. 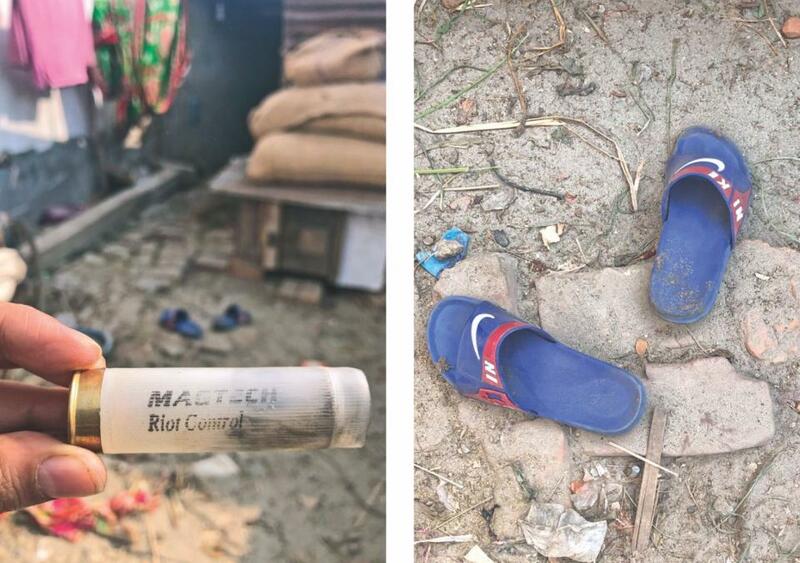 Clashes erupted between workers and police, as the police charged batons, fired tear gas shells to disperse the workers who blocked Dhaka-Mymensingh Highway. Several hundred workers of Standard Group Garment in the Kalshi of Mirpur (Dhaka) also abstained from their works. Workers living at Hemayetpur alleged that police raided their house at night and vandalised their homes. The management of Standard Group declared closure of their unit for an indefinite period. 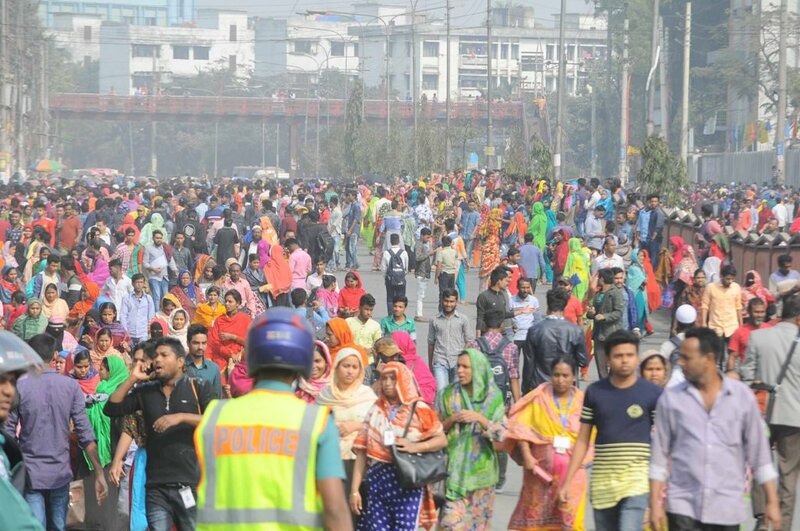 On January 12, production at over 80 factories were suspended at Ashulia, Gazipur and in the capital as thousands of workers held demonstrations blocking roads. 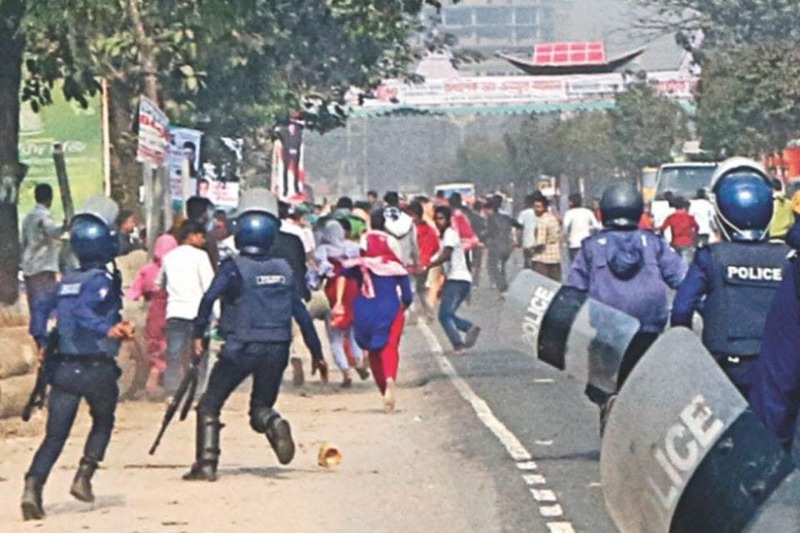 Yagi Fashion workers left their factory and tried to block Dhaka-Tangail Highway at Zamgora at 9 AM, but were forced to disperse by the police. However, soon after workers from Starling Creation, Windy Group, Palmal Group and other factories blocked the road at 9.30 AM, put up barricades and set tyres on fire, bringing traffic to a halt on the busy highway. Workers of Ha-Meen Group blocked the same highway at Narashinghapur at 2 PM. Scores of workers were reportedly injured during clashes with the police. Several vehicles were set on fire. At Tongi, hundreds of workers took to streets after plainclothes police picked up five workers for participating in the agitation. At Mirpur in the capital, workers blocked the Mirpur Road. 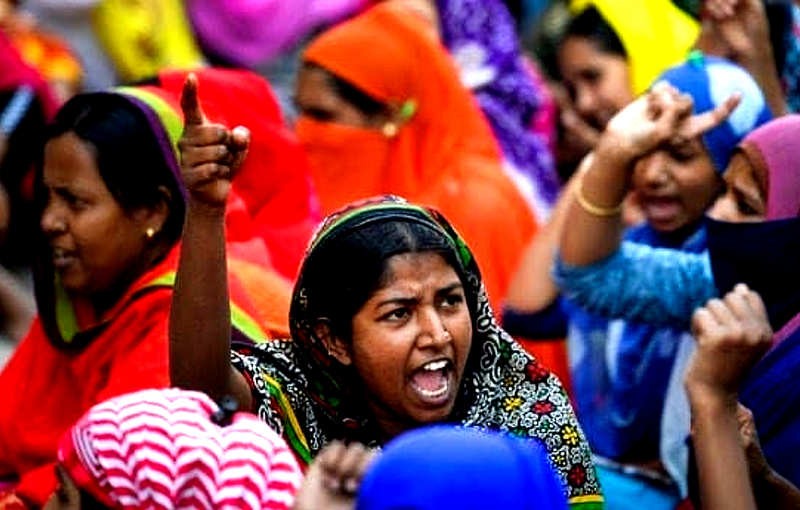 After five long years of struggle by the garment sector workers, the Bangladesh government in a gazette notification in November 2018 announced new wages for the workers. The minimum wage was set at Tk 8,000, up from Tk 5,300 in 2013. A Grade 7 worker would get Tk 8,000, including basic Tk 4,100, a trainee/apprentice Tk 5,975 a month; a Grade 6 worker would get a monthly gross wage of Tk 8,405, a Grade 5 worker Tk 8,855, a Grade 4 worker Tk 9,345 and a Grade 3 worker Tk 9,590. A Grade 2 worker would get the gross wage of Tk 14,630 and Grade 1 worker Tk 17,510. The workers rejected this new wage structure, citing disproportionate wage raise across the different grades. They pressed with their long-standing demands of minimum basic of Tk 10,000 and the gross of Tk 16,000 a month for beginners. 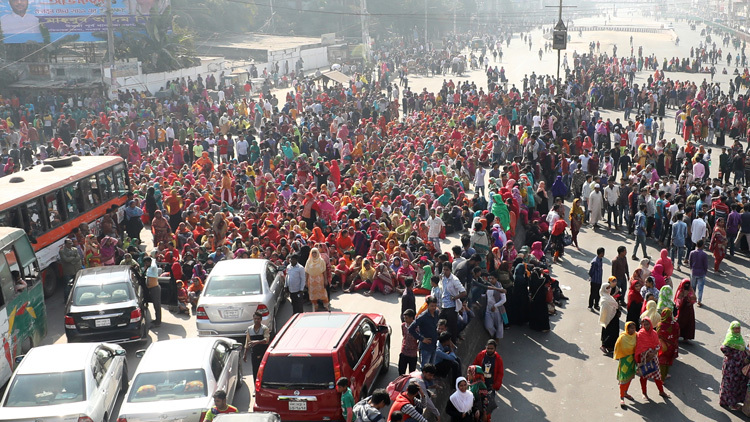 On December 6, several hundred women garment workers of New Town Knitwear Limited at Konabari in Gazipur started a sit-in for an indefinite period in front of the National Press Club in Dhaka demanding immediate reopening of the factory and payment of their three months’ due wage. At the dharna, Communist Party of Bangladesh president Mujahidul Islam Selim said, the general elections in the country cannot be held while the workers are still out in the streets and starving. Soon the unrest spread to workers in one factory after the other, forcing shutdown of at least 70 factories at Ashulia and in Gazipur and Narayanganj on December 13. Bangladesh Garment Manufacturers and Exporters Association (BGMEA) President Siddiqur Rahman alleged that “a vested quarter was instigating workers for creating a labour unrest in some 50 apparel factories in Gazipur and Ashulia in order to destabilise the situation ahead of the December 30 general elections.” The BGMEA President asked law enforcement agencies to bring ‘those people to book’. Angry workers started blocking the roads and obstructing traffic for hours. Throughout the struggle, the factory owners have threatened the striking workers with shutdowns of production units. Even when the strike was largely peaceful, ‘safety concerns’ were cited behind these shutdowns and the blames were laid squarely on the agitating workers. On 23rd December, the agitating workers of NAZ Limited factory at Rajendrapur in Gazipur got furious upon seeing the factory gate closed from outside around 8:00am and staged a spontaneous demonstrations in front of the factory. The police charged baton and lobbed tear gas shells at the protestors, leaving ten people injured. In the face of unmitigated militant protests, on January 12, a tripartite committee formed by the government to review the new wage structure finally agreed in principle to adjust the discrepancies in the wage structure. 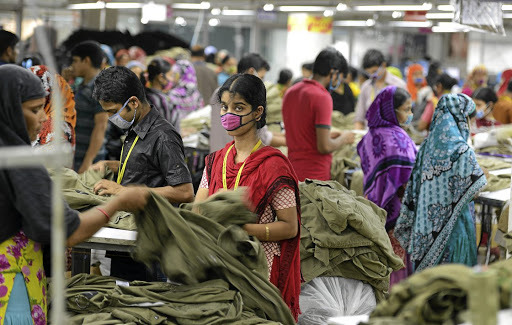 On January 13, the Bangladesh government finally announced an increase in the wages of apparel workers from grade I to grade VI, to be implemented in retrospect from 1st December 2018. The minimum wage under the 6th grade was increased to Tk 8,420 from Tk 8,405 (which was Tk 5,678 in 2013) while that under the 5th grade to Tk 8,875 from Tk 8,855 (Tk 6,042 in 2013). A 4th grade worker will now get Tk 9,347 instead of Tk 9,245 as minimum wage (against Tk 6,420 in 2013) while Grade III ones will get Tk 9,845 instead of Tk 9,590 (Tk 6,805 in 2013). The minimum wage under the 2nd grade was increased to Tk 15,416 from Tk 14,630 (Tk 10,900 in 2013) while that under 1st grade to Tk 18,257 from Tk 17,510 (Tk 13,000 in 2013). 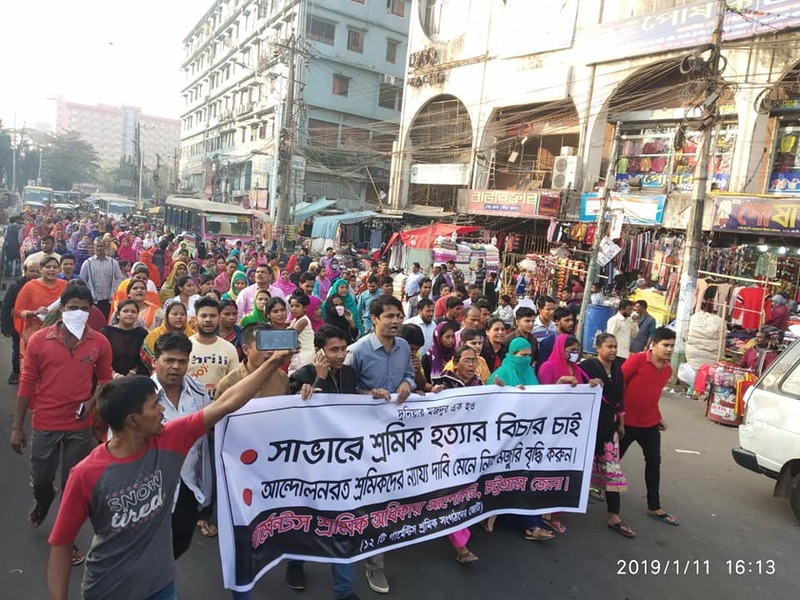 BGMEA president Siddiqur Rahman announced that the agitating apparel workers will not get their wages and factories will remain shut indefinitely if they do not join their works within a day. While workers rejected the proposed minimal increases, they returned to work in the face of pressure from Unions who brokered the compromise and asked the workers to end the strike, and under the threat of lockouts and further police repression. Garment workers in Chittagong take out demonstrations against the killing of worker in Savar. Photo: Mejbah Uddin. Source: Facebook. Throughout the agitation, the Government and the industry owners have repeatedly pointed to the role of ‘third party vested interests’ in engineering the recent unrest. The police administration announced that those responsible for instigating the workers will be arrested. 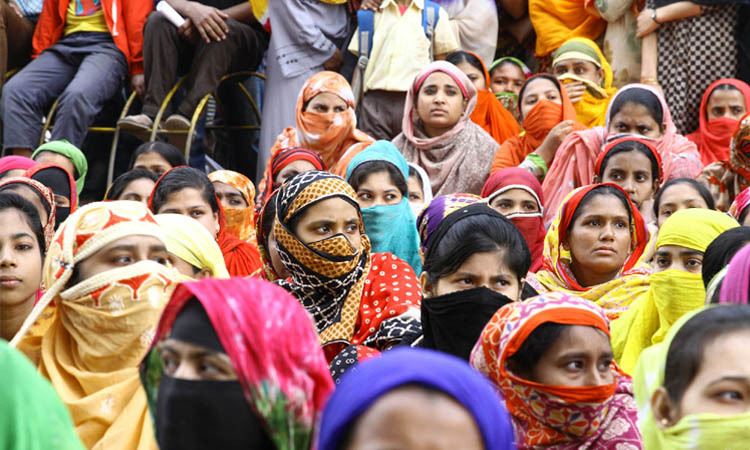 According to reports, as the workers got back to work on 15th January, more than 1,400 workers have been sacked at 16 garment factories in Ashulia and Savar for participating in the 8-day long agitation. Notices displaying lists of photos and names of laid-off workers were hung on the gates of many factories. At least 10 factories declared indefinite closure. At least 6 criminal cases have been filed by the owners against more than 900 people, including 192 specifically named, accusing them of ‘vandalising’ the factories. Ketro Knitting general manager Atiqul Islam tried to justify the mass victimisations, claiming that 300 workers had smashed his factory’s CCTV cameras and computers. He also alleged some 10,000 apparel items made for export were missing. These unproven claims of the owners were parroted uncritically by the media. 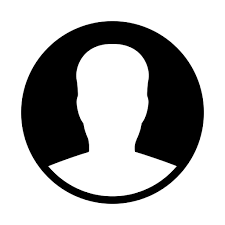 Garment Workers’ Trade Union Center’s leader and a laid-off worker himself, Jainal Abedin, was arrested on January 14. National Garment Workers Federation (NGWF) president Amirul Haque Amin told the Daily Star that the union does not want the sacking of workers “illogically or illegally” and said the union would meet with Labour and Commerce Ministers to “express our concern.” Amin is one of the union leaders who participated in the government-appointed tripartite committee, which condemned the garment workers, not the police, for violence at the January protests and demonstrations. Non-Governmental Organisations such as the NGWF have been accused by many as being key collaborators of the big companies involved in the international garments trade. “The NGWF is one of the garment sector unions affiliated with IndustriALL, the Geneva-based union conglomerate, which is notorious for collaborating with trade unions internationally to suppress industrial action. These organisations effectively act on behalf of global retail giants, such as Walmart, H&M, Mark & Spencer, Carrefour, Inditex, Tesco, and their local suppliers to ensure they continue to make super profits at the expense of Bangladeshi workers,” claims a recent report published by the International Committee of the Fourth International. The Bangladesh national economy is largely dependent on the export from the apparel sector, which fetched $30.6 billion in the last financial year, almost 83 per cent of the country’s total export earnings. Bangladesh is the second highest Ready-Made Garments exporters in the global market and the major export destinations are the US, UK, Germany, Belgium, Denmark, France, Italy, Netherlands, Poland, Spain and Canada. More than 40 lakh workers work in at least 3,500 garment factories located across Bangladesh. Following the April 2013 collapse of the Rana Plaza building in Savar which killed more than 1,000 mainly garment worker’s, the global retailers claimed they would take “remedial measures” to ensure safe working conditions and decent pay. These promises remain meaningless. According to a Centre for Policy Dialogue report last year, the average income of Bangladeshi garment workers covers only 49.9 percent of their family expenditure. Oxfam, in a September 2018 report, calculated that ‘it takes a CEO from one of the world’s top five fashion brands just four days to earn the same amount as a Bangladeshi garment worker will earn over her lifetime’. Feature image by Sophia Zaman.